The prediction game is tough. This is especially true when it comes to the tech world. Nothing seems as bewildering as seeing a bunch of Millenials wearing Snapchat’s (sorry, now just Snap) Spectacles when it was only a year or so ago that the public rejected Google Glass, which was an even more robust take on smart glasses. With the success of Spectacles and early rumors of Apple possibly getting in on the smart glasses action, 2017 is shaping up to be an exciting year. Judging by what we’ve seen in 2016, there are ten tech trends we can confidently predict will make waves in the coming year. Let’s take a look. Now that Google has introduced Google Assistant on its flagship Pixel phone, every major tech company has a virtual assistant on the market. Apple has been perfecting Siri for quite some time and Microsoft’s Cortana is a relatively new contender. Even Amazon’s Alexa is trying to change the way we approach home entertainment. In 2017, look to see one of these companies establish dominance as the most reliable virtual assistant. Technically, these are two different things, but they are often mentioned together in conversation. Now that consumer VR–spearheaded by products like Oculus Rift–are hitting the market, we’ll see how much people are willing to invest in it. VR isn’t cheap and requires a relatively strong PC in order to properly power it. But with consoles like the new PS4 Pro offering a lower monetary barrier of entry, virtual reality could be more widespread than anyone could predict. If the runaway hit of the summer, Pokemon Go was any indication, augmented reality could be headed for more mainstream success. Consumers thus far appear to be more comfortable with products that keep them more in “the real world.” Look for 2017 to be the year VR can really make its case, but look for augmented reality to have more crossover appeal. Artificial intelligence will continue to be integrated into “simple” devices and broaden the reaches of connectivity. Consumers will come to rely more on smart devices, extending beyond things like thermostats and locks and moving into the realm of disrupted professional services. Services like KeyMe’s app and kiosk-based key duplication will make inroads in the “on-demand” market that so many consumers have been buying into over the past half decade. Speaking of KeyMe and the Internet of Things, keep an eye out for more kiosk-based services like KeyMe’s to pop up in 2017. As consumers become more accustomed to around-the-clock, on-demand services and easy answers to questions like “where can I copy a key anyway?”, companies will begin to invest more in these technologies. As touchscreen technology (which we’ll get to next) continues to mature, these kiosks will provide more robust functionality and intuitive user interfaces so customers will feel more comfortable interacting with them as they pop up in more places sans a traditional customer service representative. When Apple introduced what they call 3D Touch on the iPhone 6s over a year ago, the pressure sensitive functionality seemed like an interesting gimmick that might prove to have some real, powerful uses given more developer adoption. Expect to see more devices beyond smartphones incorporating haptic feedback technology. Smarter content deployment will turn touchscreen devices into adaptable marketing platforms that display content based on location and user habits. As the Internet of Things continues to expand, firms will need to come up with better security solutions to combat incidences like this past October’s large scale DDOS attack which investigators believe originated from compromised smart devices. While it’s too early to tell what those security systems will look like, there’s no doubt businesses are investing big time in strengthening exploitable weaknesses as they look to get their products into more homes. 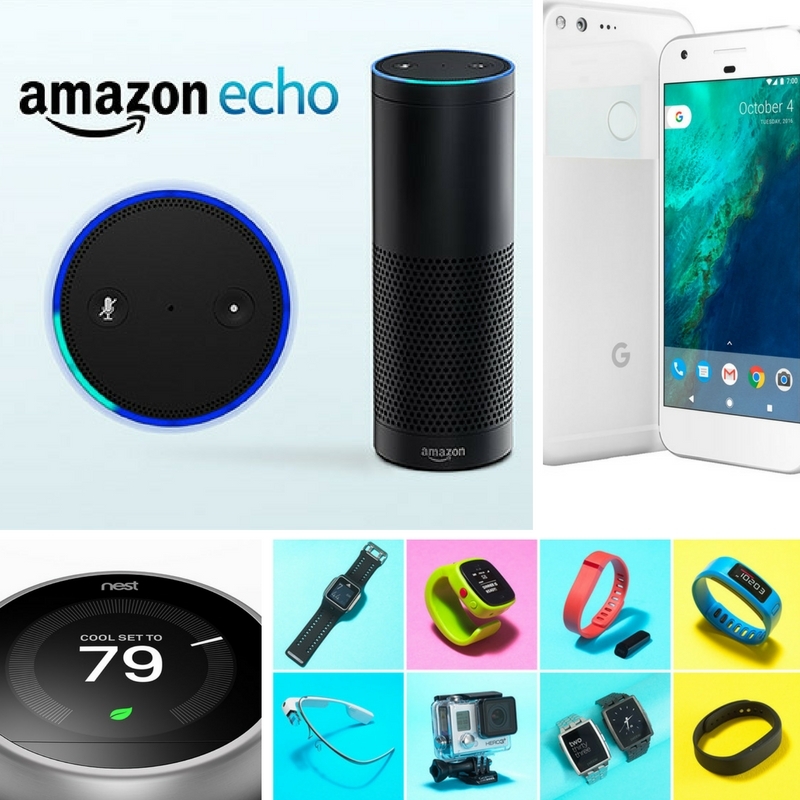 Amazon’s Echo device, powered by Alexa, has seen a fair amount of success. Expect more companies to look into conversational interfaces in 2017. While they may not all be voice command enabled, text interfaces may begin to appear on more and more devices to create a more natural experience in comparison to button-based control panels or apps. The Apple Watch, an assortment of Android wearables, FitBits, smart glasses, and more will make inroads in 2017. Google Glass may have been a bit ahead of its time, but it may be the health industry that encourages greater wearable development. The insurance industry or employers themselves will push for some version of popular fitness trackers in an effort to keep healthcare costs down via prevention rather than treatment. Bitcoin may not be the economic revolution tool it promised to be, but the technology behind it will probably mature and be used for alternative purposes. The ability to create a decentralized network that provides database information to far flung parts of the planet all at the same time will almost certainly be harnessed by businesses in 2017. Big data will continue to be leveraged in order to better understand human behavior and then implement strategies based on that information across all kinds of markets. The hope will be to go from merely understanding behavior to influencing behavior. This isn’t just in the consumer realm, either. Look to see businesses using influence algorithms to increase employee performance, reduce mistakes, and lower costs. Get trendy! Try the KeyMe kiosk by finding your local machine today! Where Can I Get A Key Copied? Closer Than You Think!